It also occurs to me that the M-brace is a great way to give a raised bed as a gift this holiday season. The four corner brackets come in a square box that would wrap up nicely with paper and ribbon, and the recipient wouldn’t have to work very hard at all to assemble a raised bed that will be a beautiful addition to the garden in spring. With M-Brace, you use only the included corner braces – you don’t need nails, screws, or other hardware, and you don’t even need a hammer, drill, or screwdriver. Simply decide on the dimensions of your raised bed, and have your lumber cut to the proper length at a building supply store. The inside of each brace has a raised channel where you slide your cut-to-size lumber to form the four sides of the bed. This system allows you to customize your raised beds to any site and any size, up to 12 feet on each side. You can use M-Brace with any 2″ lumber (2×4, 2×6, 2×10, etc.) The width of the boards you choose determines the depth of your bed. For example, using three 2×4s will give you a depth of 10.5 inches. Your raised beds can either be square or rectangular, depending on the location where you’ll place them. There’s also a mini M-brace that’s finished in bright colors and is perfect for a child’s first garden, or even a sandbox. 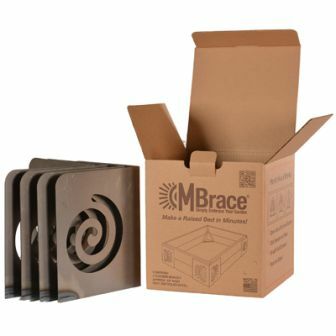 To find out more about the M-Brace, view the product video, and see all the laser-cut designs visit our retail store at www.bluestonegarden.com!